Many of our members ask us for 'bundle offers' and specials. So we want to make this special package deal available to you to get our entire Zapp! 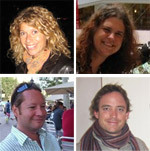 English Intermediate Super Pack at a very special discount. We want to give you ALL of these Premium English Learning Materials, worth over €64 euros if purchased separately, for a ONE-Time-Payment of only 30 €! Why Are We Making You this Incredible Offer? The Zapp! English products at each level are designed to work most effectively when used together. In this way each element reinforces the others - meaning you move more of the words into your long term memory, have greater understanding of the listening texts and get repeated exposure to, and practice of natural pronunciation. Learning a language is like painting a wall – one coat isn't enough to get the best colour! With several 'coats' your knowledge and skills won't fade. 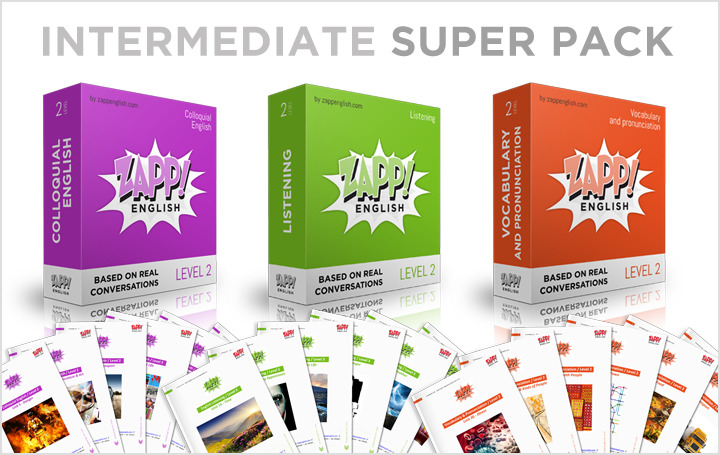 To make sure you get the greatest possible benefits from the materials we've spent years working on, and jump ahead to an advanced level of English as quickly as possible. That's a total of 24 hours of Real English audio and more than 1000 pages of eBooks & transcripts you get to keep forever for only €30 Euros!